WASHINGTON (CNS) — A Jesuit whom former Speaker of the House of Representatives Paul Ryan sought to oust in 2018 will remain in his post as chaplain of the legislative body as the 116th session of Congress begins. 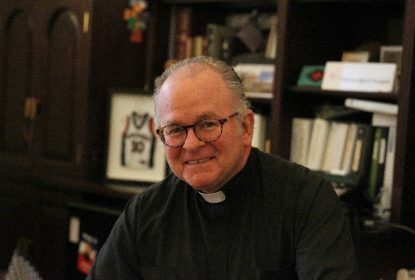 Lawmakers voted late Jan. 3 to keep Jesuit Father Patrick J. Conroy, the 60th chaplain of the U.S. House of Representatives, in the post for the next two years. He began his term May 25, 2011. As the House chaplain, Father Conroy, 68, is responsible for offering a prayer at the beginning of each day when Congress is in session. The nondenominational prayer in the House chamber is broadcast live on HouseLive.gov and on C-Span. It’s also archived in the Congressional Record and is part of the official rules of the House to get the day started. But some suspect that one of Father Conroy’s prayers in 2017 is what moved former House speaker Ryan to try to oust the chaplain. Ryan was then trying to garner votes to pass a tax overhaul bill. “May their efforts these days guarantee that there are not winners and losers under new tax laws, but benefits balanced and shared by all Americans,” Father Conroy said in a Nov. 6, 2017, prayer, a time when lawmakers were debating how some of the proposed tax laws would affect the rich and the poor. The following April, Ryan, also a Catholic, asked the chaplain for his resignation, sparking a firestorm of outrage from both sides of the political aisle and even calls for an investigation into whether Ryan could single handedly fire the priest as chaplain. Two weeks later, the chaplain rescinded his resignation and Ryan accepted it. Ryan, a Republican from Wisconsin, announced in April 2018 that he would not be seeking re-election. California Congresswoman Nancy Pelosi, a Catholic who as Minority Leader approved the selection of Father Conroy as chaplain in 2011, was sworn in as Speaker of the House Jan.3, but it was Republican John Boehner, then the Speaker of the House, who handpicked the Jesuit. Father Conroy, a lawyer, welcomed Pope Francis during his visit to Congress in 2015. In the past, he ministered to students for 10 years at Georgetown University in Washington, worked at an American Indian reservation in Washington state, and also taught high school students in Portland, Oregon.